Travel to Egypt for 6 nights / 7 days Cairo, Luxor & Hurghada holiday joining a private Egyptologist tour guide to visit the top of Egypt tourist attractions in Cairo such as the Pyramids, Coptic and Islamic sightseeing, then transfer to Luxor to visit Karnak temple, Queen Hatshepsut temple, Valley of the Kings, after that move to Hurghada to enjoy a recreational time in the Red Sea. Book Now!!! Two Nights accommodation at 5* Hotel in Cairo based on B.B. Two Nights accommodation at 5* Hotel in Luxor based on B.B. Two Nights accommodation at 5 Star Hotel in Hurghada based on All Inclusive. All transfers by a private A.C. Cars. An expert Egyptologist guides during all your tours. Domestic flight tickets from Cairo to Luxor and from Hurghada to Cairo. Upon arrival to Cairo airport, our representative will assist you through passport control formalities, luggage identification & portage will greet you. From the airport, you will be transferred by a private A/C car to your hotel for check-in. The Egyptian Museum displays a rare collection of 5000 years of art. Over 250,000 genuine artifacts are presented, including an exhibit dedicated to Tutankhamen collection of treasure, gold, and jewelry which was enclosed in his tomb for over 3,500 years. Then transfer to Cairo airport for a flight to Luxor and check in 5* hotel for overnight. Luxor Temple was the center of the most important festival, the festival of Opet. Built largely by Amenhotep III and Rameses II, the temple’s purpose was a setting for the rituals of the festival. The festival was to reconcile the human aspect of the ruler with the divine office. Lunch will be served on an island, so your tour includes a boat trip, then back to your hotel for overnight. Two massive stone statues of king Amenhotep III are the only remains of a complete mortuary temple. The statues are made from blocks of quartzite sandstone which exist in Cairo then moved 700 KM to Luxor. Have your lunch on a Nile view restaurant before we drive you to your hotel in Hurghada. After breakfast, check out from your hotel to end your Hurghada holidays, then catch the evening flight to Cairo and overnight. Breakfast at the hotel. 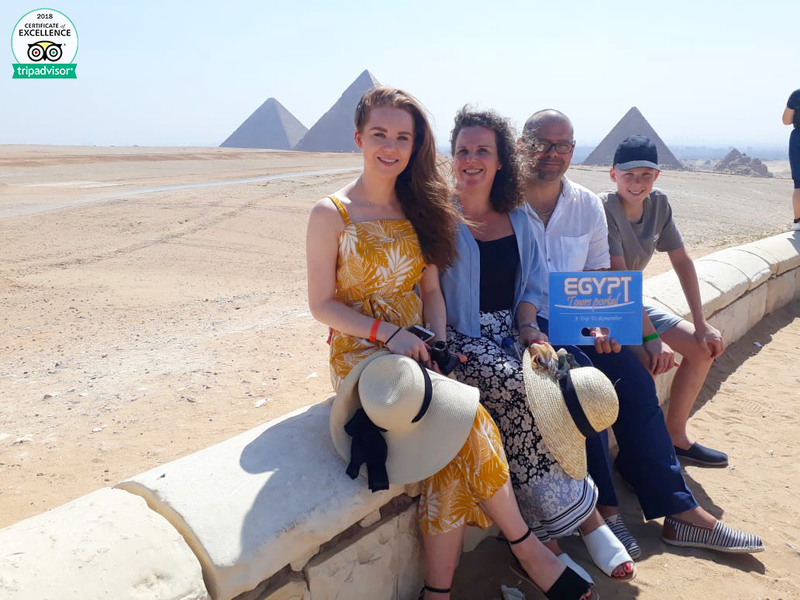 Our representative will transfer you to the airport and assist you at the airport through final departure formalities to end your 7 Days Cairo, Luxor & Hurghada holiday. Took part in the Egypt 6 night 7 day tour and had a wonderful time! Our tour guide, Mahmoud Nour was so knowledgeable, friendly, and patient with a great sense of humor. Each day of the tour was planned perfectly at a great pace. I would highly recommend this tour for anyone who’d like the perfect blend of historic sites, great accommodations and the right amount of culture. Cheers! An excellent company, well organised with excellent customer service. We had Reham as a guide, she was extremely helpful and made the tour that much better for us. We will deffinately be back to explore more of this country! Amazing tour ! Reham was an amazing guide with lots of knowledge and great customer service . Highly recommend portal tours for a great experience. We are two girls taking the 7 days tour with Egypt Tour Portal, visiting Cairo, Luxor, Aswan, Abu Simbel and Hurghada. We pay around 950 euro having everything inclusive: private car, tour guide, five star hotels, two domestic flights, safari trip and scuba diving. Very professional tour guide in Cairo with Mr. Halemoo and in Luxor/Aswan/Abu Simbel with Mr. Mohamed. The trip organizer Mr. Ahmed Sameer is indeed very helpful 24/7 with good price offering and always quick and customized response. Special thanks to Mr. Halemoo – he is a brilliant photographer and egyptologist. He patiently took hundreds of photos for us two girls around Giza pyramides. His dedicated illustration over Egyptian history did stay in my head, making it part of an unforgettable memory of the trip. Sincerely thanks a lot ! But true that as any of other tour package, visiting partner souvenir shop was also included in our tour schedule however it was not mentioned in the trip description. Just keep in mind if you book with Egypt Tour Portal, some surprising visit may occur. I am usually not a easily pleased traveler, but I am definitely satisfied with this experience with Egypt Tour Portal.